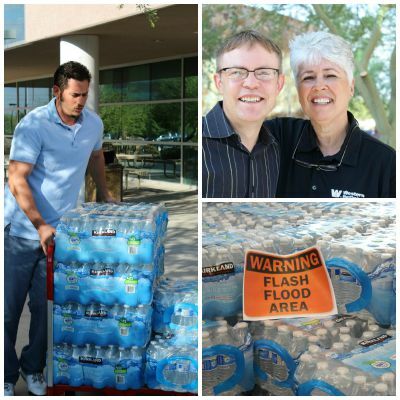 (Tempe, AZ) – A New Leaf received a large donation of bottled water this summer to benefit individuals and families staying at A New Leaf’s shelters and affordable housing units from Western Refining. With 1,000 cases of water, A New Leaf will be able to help homeless individuals outside in the heat with life-saving water, and provide water to residents of our shelters. Western Refining received an outpouring of support from employees who gave donations of bottled water to provide to A New Leaf’s families and children. The donation is among the largest ever provided by Western Refining to nonprofit partnering organizations. The Summer Hydration Campaign runs through August 31, 2015. Bottled water is requested from the public and can be delivered at A New Leaf locations across the Valley. Call 480-464-4648 for more information.